I’m home for five whole weeks – joy! I can’t remember the last time I was home for so many consecutive weeks, but I think it was late last summer when I had pneumonia so that doesn’t count. The nice tuner from Ruggero Piano, like every (I swear, EVERY) tuner who has ever tuned this old Kawai, told me what a nice piano it is, and that I should hold onto it. He echoed past tuners in telling me it was an exceptional version of this model, and that they just don’t make ’em like this anymore. This is amazing. I love this piano, but it has not lived an easy life. Unpractically and unfrugally, I have moved it all over the country. Each time I’ve moved I’ve considered selling it and buying a nice electric, weighted-key piano which would make all future moves easier, but I can’t part with the Kawai. It has a nice touch and a warm sound, and there’s nothing like a real piano. The cabinetry is worse for wear. There are nicks all over the legs from being tied to too many trailers. 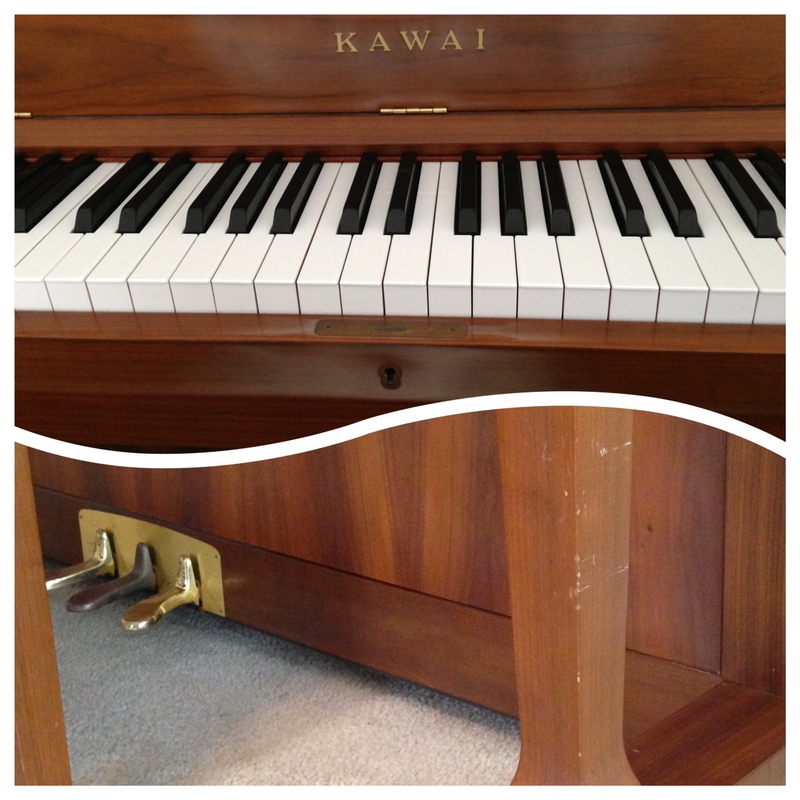 The finish has faded to a weird cloudiness around the Kawai name and key hole. The middle pedal long ago turned a frightening dark, matte color. But the instrument inside has weathered it all well. The piano still sounds great, and it holds tuning very well, which is bad for piano tuners but good for my finances. Despite its many scuffs, the piano remains a beautiful piece of furniture that holds a place of honor in our living/dining room. July 2010: moved by piano movers back to my parents’ for one last stay! 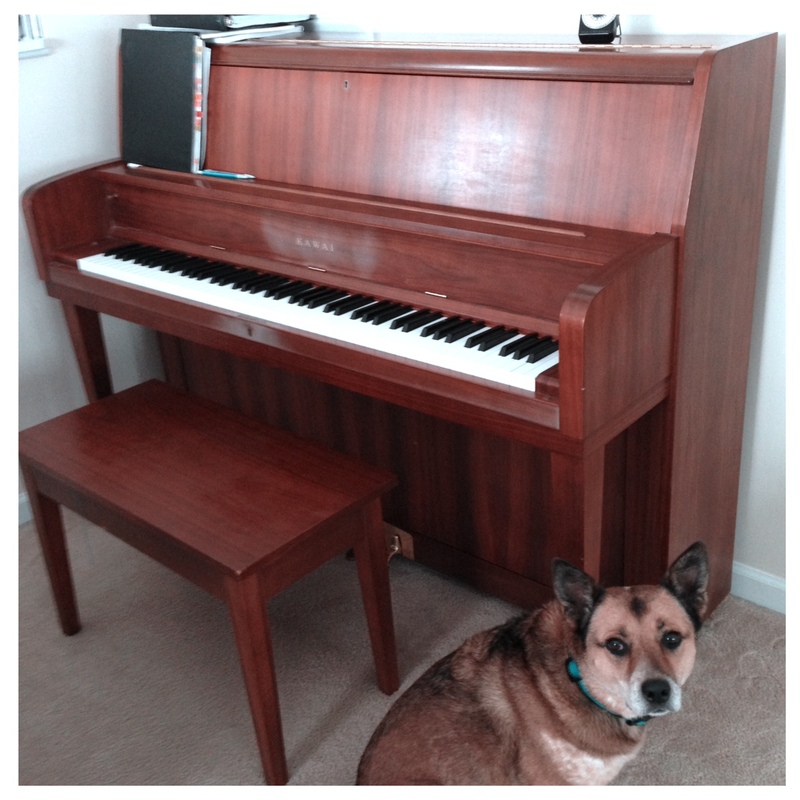 May 2013: piano gets a tuning after having not moved at all in over two years! That was longer than I expected. Poor piano. I’m not much given to naming things, but after over 20 years it might be time for a name for my trusty musical companion, which always waits faithfully at home. Do you have any ideas? Leave me a comment below.